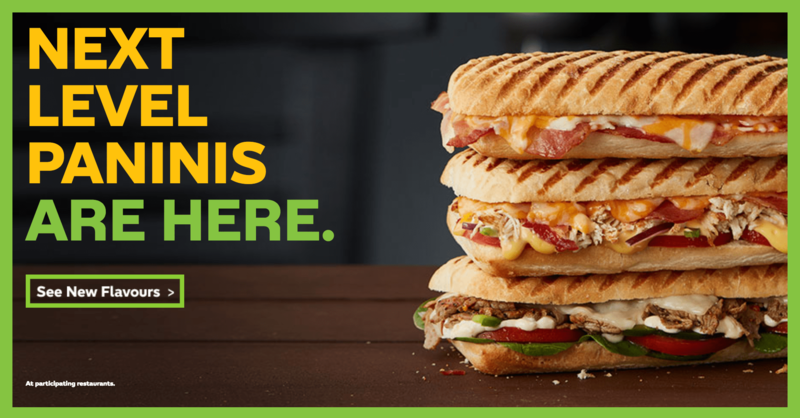 Montreal Steak & Provolone Panini: combines exciting flavours all pressed to crispy perfection on the Panini grill. Featuring tender Montreal seasoned 100% Canadian shaved steak, premium provolone cheese drizzled with savoury garlic aioli sauce and topped with baby spinach, juicy tomatoes and green peppers on freshly-prepared ciabatta bread. Sweet & Smoky Chicken and Bacon Panini: featuring layers of Rotisserie-Style chicken with sweet & smoky seasoning and maple wood smoked bacon drizzled with smoky honey mustard on freshly-prepared ciabatta bread. Topped with juicy tomatoes, red onions, green peppers, extra Monterey Cheddar Cheese and pressed to perfection on the panini grill. Grilled Cheese and Bacon Panini: It’s the classic melty-cheese taste you love, pressed on the Panini grill. They combine Monterey cheddar and Provolone cheeses with maple wood smoked bacon. More cheese is then sprinkled on top of freshly-prepared Ciabatta bread pressed to perfection, melding all the flavours together to deliver a warm and crispy grilled cheese experience. Click here to find a Subway restaurant near you! Gross and disgusting. The worst thing ever.